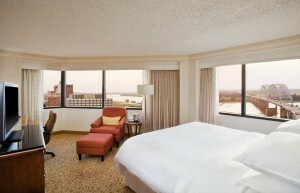 Elvis may have left the building, but his legacy is alive and well in Memphis. 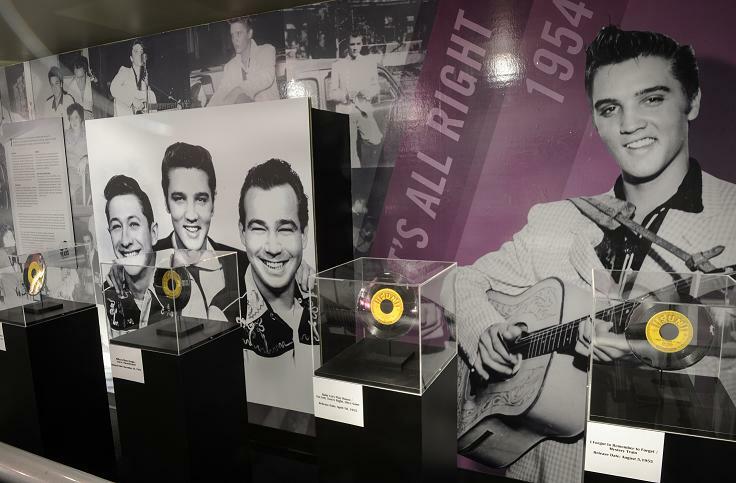 This year marks the 60th anniversary of Rock and Roll and it is being celebrated throughout this city where it all began, with new exhibits at Graceland, Rock ‘n’ Soul Museum, Stax Museum, and of course, Sun Studio. When I visited Sun Studio (www.sunstudio.com) at 706 Union Avenue 15 years ago, it felt like a holy place. After I left this brick building on a non-descript street of auto repair shops, I looked up and there was an image of Elvis in an upstairs window. It gave me goose bumps. It still feels that way. Perhaps because it’s so ordinary, a 18 x 33-foot room with venetian blinds that could have been an insurance office. In addition to Elvis, many greats got their start here, including Johnny Cash, Carl Perkins, and Jerry Lee Lewis. Their photos line the walls, and there are well used musical instruments in the corners of the room–bass, drums, guitars. Visitors like to have their photo taken holding the microphone that Elvis used. This is hallowed ground to other musicians, who still do sessions here. Bono has recorded here and I noticed Jakob Dylan, Bob’s son, was scheduled. 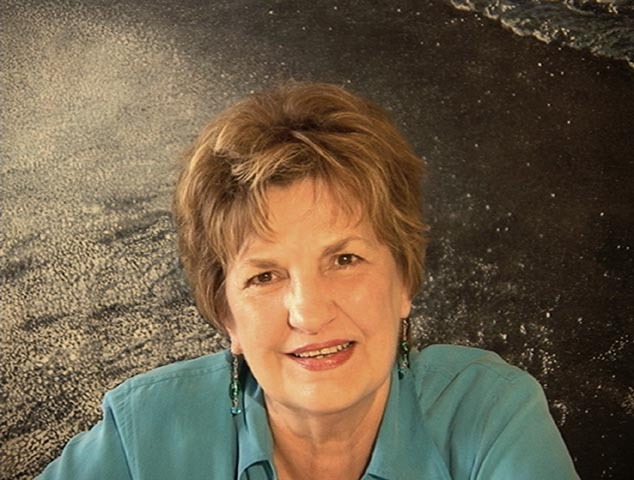 Elvis came by one day with his four dollars to make a recording but it was Phillip’s assistant, Marion Keisker, who first thought the youngster had potential. After many visits, Sam suggested Elvis get together with Scotty Moore and Bill Black and come up with some material. They did, but it was not until the formal presentation was over and they were just fooling around with “That’s All Right,” a blues number by Arthur Crudup, that Sam recognized something magical. Thus began the revolution in music pulling blues, country and gospel into a new form that became rock and roll. The following year, Carl Perkins’ Blue Suede Shoes became the first recording by a white man to be played on black radio stations—and white stations eventually began airing black artists. The studio became a national landmark in July 2003, one day after Sam Phillips died at the age of 80. At the Rock ‘n’ Soul Museum (www.memphisrocknsoul.org) on Beale Street at the junction of Highway 61, the famous blues highway, you can see “Sixty Years of Rock n’ Roll: 1954-2014,” curated by The Smithsonian Institution. It is a timeline of memories and memorabilia beginning with the recording of “That’s All Right” at Sun Studio. Be sure to watch the video of Scotty Moore recalling that great day, and another with Sam Phillips who said, “It was like somebody stuck me in the rear end with a brand new pitchfork.” You will learn about the musical pioneers who, for the love of music, overcame racial and socio-economic barriers. A film introduces the exhibition and there’s much to see in seven galleries. A small but powerful new exhibit, “60 Years of Elvis,” runs through 2015. Front and center is a photo of Elvis with Scotty Moore and Bill Black, with the famous record that started it all. Elvis’ three Grammy awards are there—although he was nominated 14 times, he won only for gospel recordings. But gospel is what Elvis most loved as a kid singing in church with his mom and dad. There’s a telegram Elvis sent to his parents after his first live appearances in the south with Scotty and Bill in 1954, “Hi Babies, here’s the money to pay the bills. Don’t tell no one how much I sent. I will send more next week. 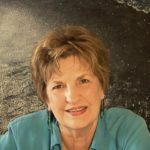 There is a card in the mail.” I found myself choking up as I walked through, thinking of the great American tragedy that became Elvis’s life before his too early death. There are videos from other rock stars influenced by Elvis, such as Bruce Springsteen, who as a kid was arrested for trying to scale the fence to get into Graceland, and who early on said he wanted to be Elvis. 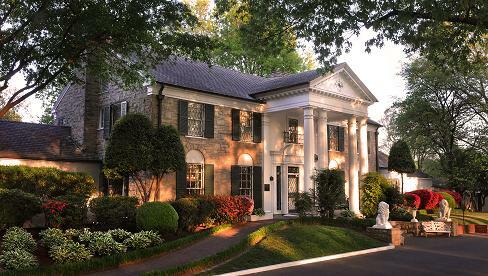 Elvis’ earnings from Heartbreak Hotel, his first RCA recording, allowed him to buy Graceland, now a national landmark, for $100,000. As you walk through the rooms of the house, you notice several foreign languages being spoken by visitors (tours are given in 9 languages). 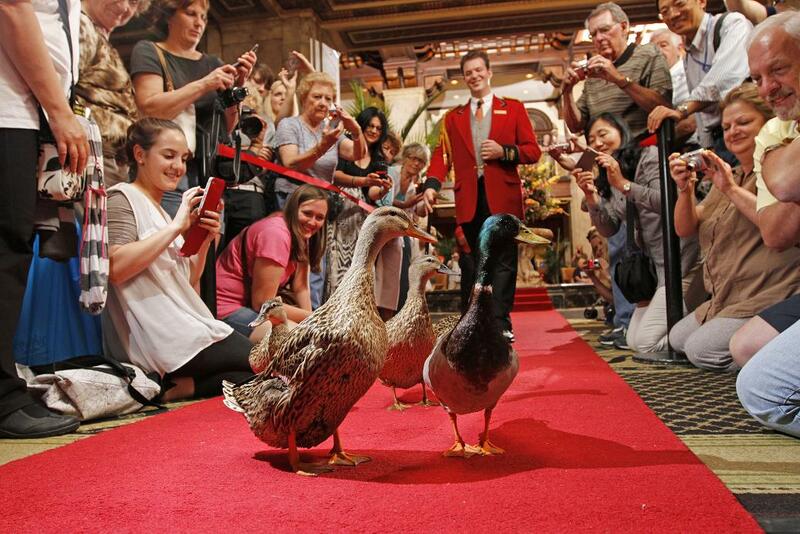 Of the 600,000 annual visitors, many come from abroad. The day after I was there, Prince William and Prince Harry took a private tour. It is a comfortable home with the upstairs still used for family visits by Elvis’s widow Priscilla, their daughter Lisa Marie, now 45, and four adult grandchildren. The quite ordinary, but warm and comfortable 1950s kitchen is where they cook. I like to imagine Elvis enjoying his favorite fried peanut butter and banana sandwich or a chicken fried steak here. 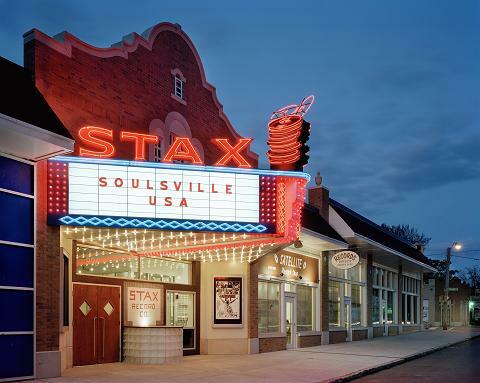 All of our great soul music from Otis Reading, Isaac Hayes, and others was recorded in the famous Stax Recording Studio then housed in a remodeled movie theatre. Today the Stax Museum of American Soul Music (www.staxmuseum.com) at 926 E. McLemore Avenue encompasses the Soulsville Foundation and the Stax Music Academy, a charter school for at risk kids to assure they go to college. It was started in 1957 by Jim Stewart a white banker and country fiddler, and his sister, Estelle Axton, who mortgaged her home to provide the capital to keep it going. (The name comes from the first two letters of each of their names.) The museum is in a recreated building on the original site of the recording studio. “Trace the Roots of Soul” exhibit includes a recreated AME chapel (American Methodist Evangelical) from the Mississippi Delta and Studio A, where so much great soul music was recorded. A special exhibition, “The Grammy Goes to Memphis,” runs through October, a year-long tribute to a city that produced an exceptionally long list of Grammy winners. Be sure to watch the film tracing the history of Stax including interviews with some of the stars. Steve Cropper, the guitarist for Booker T and the MGS, the mixed black and white house band in the 1960’s that originated the unique Stax sound talks about how blacks and whites worked and lived together to create music in Memphis. Cropper tears up when talking about the Martin Luther King assassination in 1968; “Nothing was the same after that,” he said. National Guardsmen were stationed on the roof of the studio. You can explore that in depth at The National Civil Rights Museum at 450 Mulberry Street (www.civilrightsmuseum.org) which just had a re-opening this year. This, too, is hallowed ground—the Lorraine Motel where Dr. King was shot. Artifacts, film, exhibits, focus on the events of the 1950s and 60s. Memphis has restaurants serving sophisticated farm to table cuisine, such as Restaurant Iris and Sweet Grass, but barbecue still rules. Each May grill masters from around the world compete in the largest world class barbecue cooking event, sometimes known as the Super Bowl of Swine. Memphis style ribs are marinated overnight and then smoked. Dry ribs are savory sweet and spicy and sometimes come with a so-called “mop sauce,” of paprika, tomato, vinegar and other secret ingredients. A favorite of Memphians is Central BBQ (www.cbqmemphis.com) where meats are slow smoked in the pit over hickory and pecan wood. Sides include greens, pork rinds, barbecued beans, and slaw, all quite wonderful, but what lingers in my culinary memory is the light and creamy peanut butter pie. 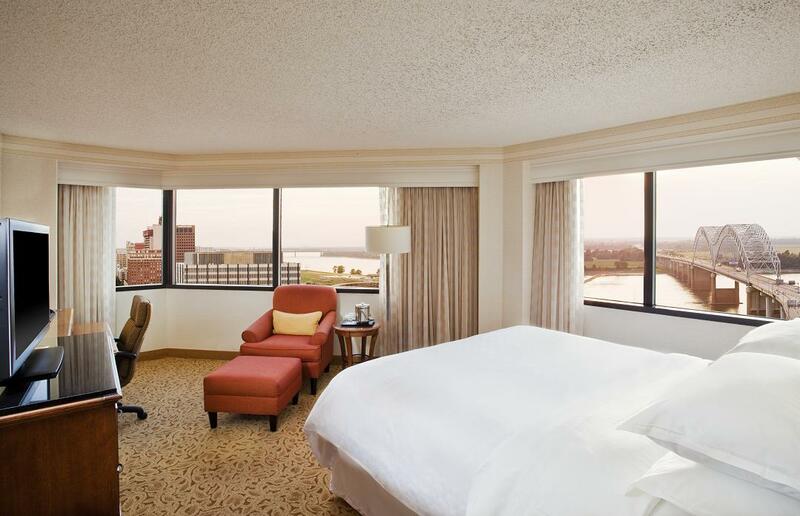 The city’s largest hotel is The Sheraton Memphis Downtown Hotel, where you can get a room overlooking the mighty Mississippi. The culture of this river was the source of the great music created here, and looking out the window you can almost hear the blues and field hollers across the miles of cotton fields, and see the barges hauling bales of it up and down the river. (The Cotton Exchange, now a museum, was to Memphis what the Stock Exchange is to New York.) Black cotton pickers and white sharecroppers grew up with blues and gospel, which both whites and blacks learned at their respective Assembly of God churches. Elvis, too, had a notion to do something with this music he loved, but it was hidden until Sam Phillips discovered it more than half a century ago. Wow! Has it really been 60 years? You may leave Memphis but it won’t leave you anytime soon.